Portable generators can provide a useful back-up power supply for caravanning ‘off-grid’, but make sure that the model you choose will be suitable for your requirements. 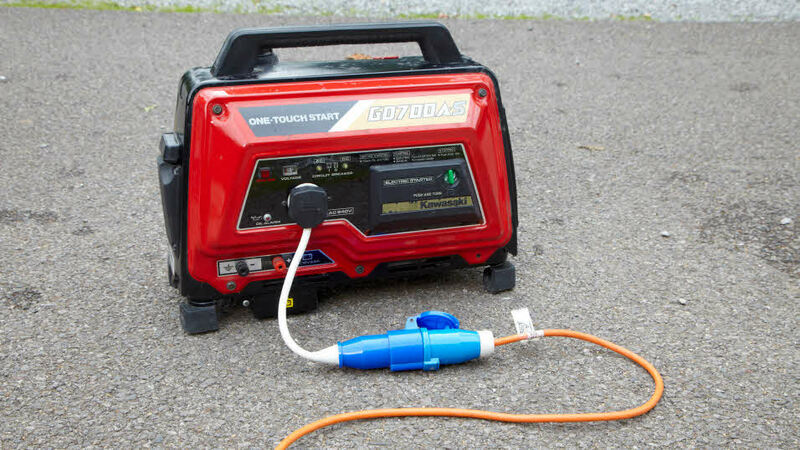 Portable generators are a means of providing an alternative when mains hook-ups are not available – but it is important to use them with due consideration to fellow campers. Generators are available in a wide range of outputs with those suitable for caravanning generally rated in the 300 to 900 watt range. Not all generators are suitable for use with caravans and care must be taken to select a product, which is both safe and effective. These are examples; check the maximum wattage of your own appliances. Remember that start-up current may be greater than the running current. In this example, a generator that will supply at least 505 watts would be needed (if in doubt choose the next size up). Some appliances are not suitable for use with most portable generators, such as microwave ovens, as generally they require an input of at least 1000 watts. Most generators are quoted at 50Hz, which is a UK standard (and essential for equipment like TVs). Appliance manufacturers are likely to refuse warranty claims if the wrong frequency is selected. Most ‘leisure type’ generators use unleaded petrol (but check the user instructions). The fuel must be carried in approved containers carrying the British Standard mark. Do not use old oil cans or similar containers, as garages will refuse to refill non-standard cans. Like any engine, a generator will also consume oil, so levels need checking regularly. Along with emissions and safety, this is one of the key considerations when using a generator – especially if there are other campers or caravanners in the vicinity. EEC regulations implemented in 1989 require portable generators (under 2kVA) to have a maximum noise level of 100 LWA (a decibel-type unit to EC standards), which is measured at four metres. Decibel levels are usually taken at seven metres and will therefore be much lower, but manufacturers differ. Remember, even relatively quiet generators can have a high annoyance level to others nearby. It is strongly recommended that you ask to hear a generator running before you buy. If you think it sounds noisy, then so will your neighbours on a site. We are not aware of any commercially available way of further silencing a portable generator that would not adversely affect its performance or cooling, but careful siting can reduce the nuisance. On Club sites, generators should not be used between 6pm and 9am. If medical needs dictate more frequent use of a generator, inform the warden before pitching or ideally use an electric hook-up instead. Modern mains/12V units in your caravan are designed to run off a normal voltage-stabilised UK mains supply, ie 230V 50Hz with live, neutral and earth. If the generator supply differs from these requirements in any way, the function of the unit may be impaired, and any unit warranty may be invalidated. Portable generators are not usually separately earthed, which can result in any earth fault detection equipment in the caravan functioning incorrectly. Different makes and models of generator have different earthing requirements, so the manufacturer’s advice should always be sought first. Never use an earth spike and generator when the caravan is also connected to a regular mains supply. This would breach the regulations controlling the site’s earth supply. There may also be a problem with compatibility between generator supply and the requirements of the caravan battery charger unit, so we suggest contacting the manufacturer of this unit in your caravan for clarification. Most caravans made since 1997 are now designed to allow portable power generation, but check with the charging system supplier. Some generators have a 12V outlet. This is a ‘nominal’ 12V. It should actually be about 14V or it will not fully charge the battery. Ask the dealer to quote the actual value. Note that the 12V output may not be suitable for direct connection to appliances (eg TV sets) depending on the actual voltage requirement of the appliance. Smaller leisure generators usually have one or two outlets which accept normal domestic 3-pin 13 Amp plugs. These are obviously intended for normal household use and are not water or corrosion resistant, so the generator should not be left out or used in the rain or damp conditions. It is better to use generators which use socket outlets and plugs conforming to BS EN 60309-2 the same as the blue mains hook-up ones on Club Sites - which have some measure of weather resistance, but this does not mean the generator can necessarily be used safely in wet conditions. Mains voltage electricity in any form is potentially dangerous so always read the manufacturer’s instructions carefully and follow them. Remember water and electricity are a potentially lethal combination so wet hands/wet generators/wet appliances must be avoided. Follow the manufacturer’s instructions faithfully. Specially designed covers are available which provide a degree of weather protection for the generator, and which can be used while the generator is running. Make sure the caravan’s mains isolator is in the “off” position before starting the generator. Remember that, electrical safety apart, generators are potentially hazardous items, which use a highly flammable fuel and have parts which can cause serious burns if touched. Never leave a generator unattended where young children are at play, and take care when siting it so as not to cause danger to other site users. Long dry grass is a hazard as some parts of the generator become very hot under load. Don't place the generator in the awning for wet weather use because exhaust fumes are produced. Adequate ventilation is vital. Don't place the generator under the caravan, as fumes could be drawn into the caravan via an air vent. Have the whole unit checked over by a qualified electrical contractor before using it. If there is any doubt, do not buy. A 1000W model can be about 15kg, whereas a 2000W version is likely to be over 20kg. Take care where you place this weight when travelling and remember to include it in your payload calculations for car and caravan. Portable generators are easy to steal and attractive to thieves. Do not leave the generator on view when unattended. To store it in the awing, wait for it to cool down first and shut off the fuel tap but be aware that a tank of fuel is a serious fire hazard. It is not advisable to chain the unit to the caravan chassis when in use unless you can be sure it will be electrically isolated from the chassis at all times. If you only need power for a few days away from mains hook-up, consider the alternative of a second large (eg 110 Ah) leisure battery instead. A couple of batteries, perhaps with a degree of recharging from a solar panel, will supply modest power demands for several days for no more than a small generator costs, and with much greater ease of use.